Google has started launching its Augmented Reality feature on Google Maps, which is being currently tested by a few number of users in the US. The AR feature will allow users to see a mix of camera imagery and animations that will show on the Maps screen such as arrows, landmarks, animated creatures. This way you can know how to reach your destination while also knowing what’s around you on the phone screen. 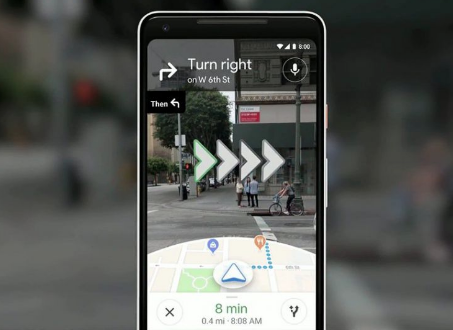 Google had announced this feature for Google Maps back at the IO developer conference in 2018, where it said it would be implementing a new way for its users to find their way on Maps with the help of AR, artificial intelligence(AI) and your phone’s camera. The feature will also be capable of showing you nearby restaurants, business in the cities that Google has made it active. The company is not yet on the road to make this feature a global rollout as there is still more trial and tests to be done until they are completely satisfied and ready for the rollout. But, the select users, who are basically advanced Google Maps users, are getting to experience this feature first hand and enjoy it and they are really lucky to try it out before the rest of the world. The Maps app has a dedicated button that switches on the AR mode that opens up the camera, and starts analysing your surroundings using Street View data. The app then superimposes arrows on to the real world to show where you have to head next. The feature also gets activated if you hold your phone upright for the camera to capture the real world.